Tanks were in all sorts of shapes in the early days. The French super heavy tank Char 2C could be one of the most attractive tanks because of its huge size. It weighed about 69t with a length of 10.27m. Compared with modern main battle tanks, it can still be called a giant. It was equipped with an electrical transmission, engines with 500hp output and a 75mm main gun. Its armor was 45 mm at the front and 22 mm at the sides. This surprising configuration made this tank a “science fiction” in the first two decades of last century. However, it’s too late for the Char 2C to appear in the last battle of WWI. The only 10 tanks were only used in propaganda by French Army. With the appearance of new tanks after WWI, this giant was finally obsoleted by the time. 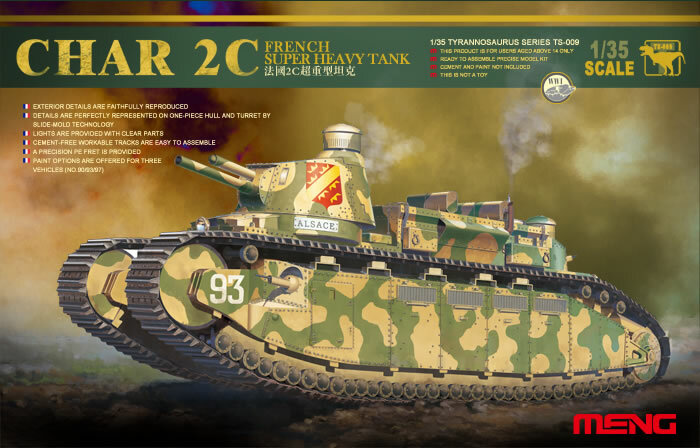 MENG brings you this 1/35 scale TS-009 French Super Heavy Tank Char 2C kit. The kit consists of 544 parts, including parts on 16 sprues and 150 track parts. There are 10 PE parts on one PE fret. Slide-mold technology is widely applied to greatly improve the precision of parts as well as simplify assembly steps. Cement-free workable track links are easy to assemble. This TS-009 kit will perfectly replicate this French armor giant for you. The model is about 294mm in full length and 86mm in full width. Three paint schemes are provided.